Hello! I bought a refurbished Lulzbot Mini about 9 months ago, and it has been acting great up until recently. About two weeks ago, I noticed that the temperature readings displayed in Cura were diverging slightly from the set temperature, usually by no more than 4-5 degrees. 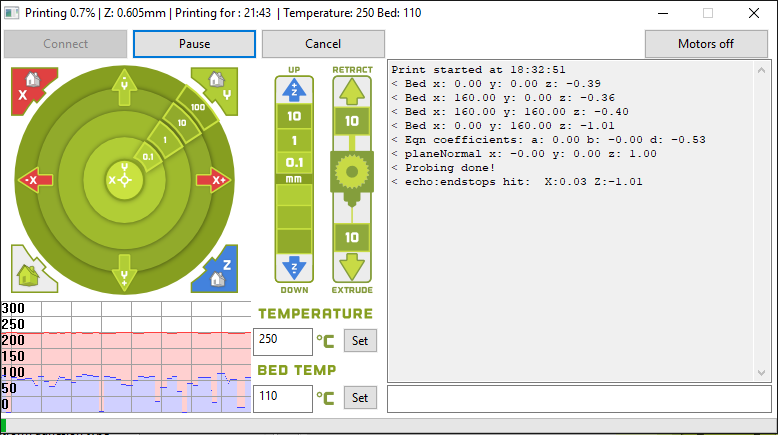 However, today I started printing and noticed that the bed temperature readings are differing significantly from the set temperature, reporting readings of as low as 2 degrees or as high as 118. Would this be an issue with the connection between the sensor and the control board? How would I go about fixing that? Is it some other issue? Any help would be appreciated. Thank you! The thermistor wires are broken in the cable chain somewhere between the control board and the thermistor on the heat bed. That is about the only thing that will cause the readings to change so fast as shown in your graph.